A buttress is a big pile of stone that keeps a building’s walls from falling down. If you build a building out of stone, and then put on a stone roof with a barrel vault, you have a problem: the roof is so heavy, and it presses down so much on the walls, that the walls get pushed outward and fall down. Why not just make the wall stronger? To keep the walls from falling down, you can make them very thick and strong, with only little tiny windows. But then your building will be very dark (especially since there were no electric lights in ancient Parthia or medieval Europe!). A better approach is to use groin vaults to direct most of the weight of the roof to specific places on the walls. Then you only have to brace those places, and in between you can have big windows to let the light in. Those braces are called buttresses (BUT-ress-is). People used buttresses from the days of the Roman Empire and the Parthian Empire through into Medieval Europe and the Islamic Empire. What is a flying buttress? 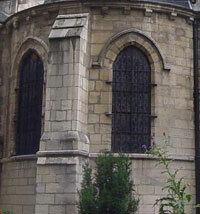 Around 1150 AD, in medieval Europe, architects began to also use a new kind of buttress called a flying buttress. With a flying buttress, you could make even bigger windows than with ordinary buttresses. What’s a flying buttress then? Cite this page: Carr, K.E. What’s a buttress? History of Architecture. Quatr.us Study Guides, May 24, 2017. Web. April 18, 2019.